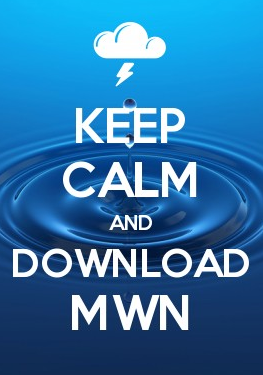 MWN Blog: Elevated rain chances, then more pleasant summer weather ahead! 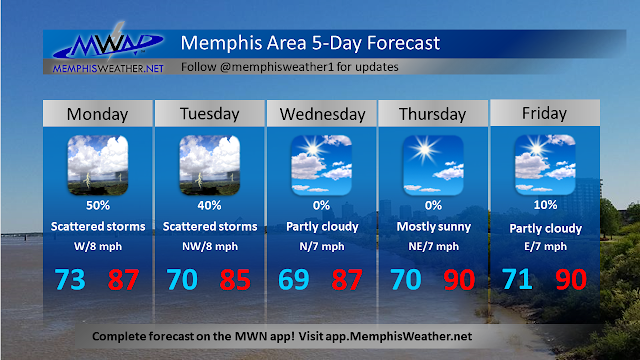 Elevated rain chances, then more pleasant summer weather ahead! The Mid-South experienced a couple of days of near to slightly below average temperature and humidity days this weekend and now we look ahead to the upcoming week, which had been promising a wet start then more decent weather to end the week. Let's see if that has changed any given the latest computer data and current state of the atmosphere. 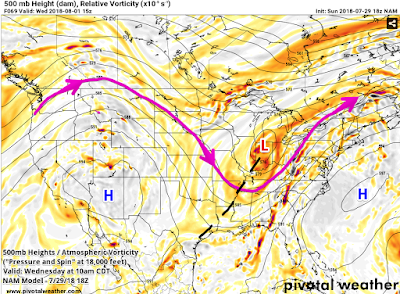 We head into Sunday night in-between any major systems as weak high pressure controls much of the eastern U.S., but low pressure is forming to our west. At the upper levels, a disturbance in the force will move across the area through the first half of the night, leading to a chance of a few showers, mainly in northeast AR. A much more moisture-rich airmass sits to our south, but will start to move north tonight as a stationary front lifts into our area by Monday. Temperatures will be near average in the lower 70s. Monday brings another late day pocket of upper-level energy across the area, so while much of the day should be dry, more scattered showers and thunderstorms are possible by late afternoon and evening. They will tap into a more humid and unsettled airmass with the surface front nearby, so a couple of storms could be strong. 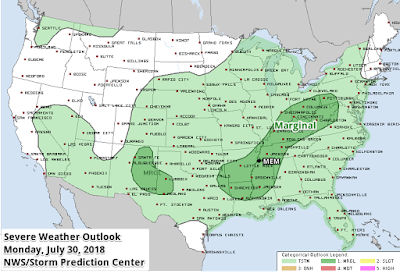 The Storm Prediction Center currently has us in a Marginal Risk (level 1/5) for severe weather, though high-resolution models indicate that the prime area of concern for storms could slip by to our south and west. Expect highs to be below normal - in the mid to upper 80s. 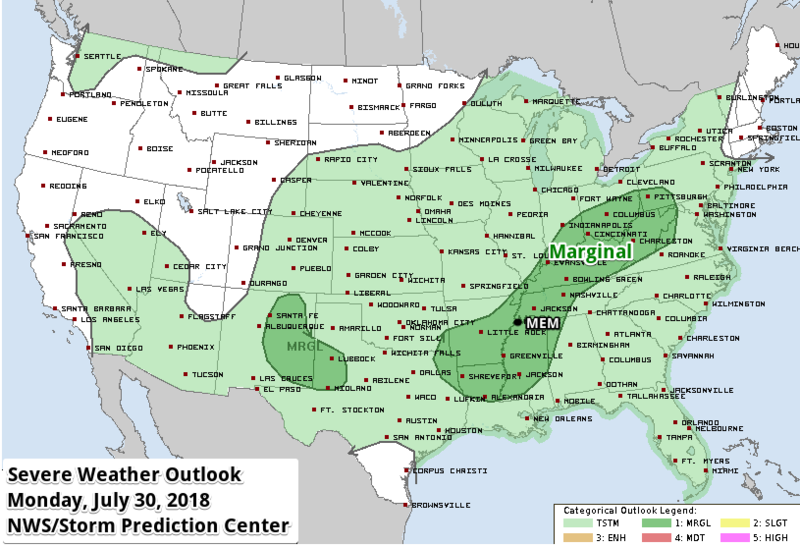 A Marginal Risk (level 1/5) of severe storms is forecast for a broad area from the Ohio Valley southwest into the Arklatex on Monday. A few storms could having strong wind gusts in the PM hours in the Mid-South. On Monday night, expectations are for a wetter pattern with weak low pressure moving along the front draped over the area. That said, the latest model data has been trending a little drier than we had thought late last week. We're still going with "likely" for the rain chances, but it may not be as heavy or prolonged as first thought. By Tuesday, an upper level trough will form over the Midwest and Mississippi Valley, which will begin to shove the cold front to our east. Once again, there is a chance of scattered showers and thunderstorms, but the severe threat appears minimal and rain chances move east with the cold front as the day goes on. 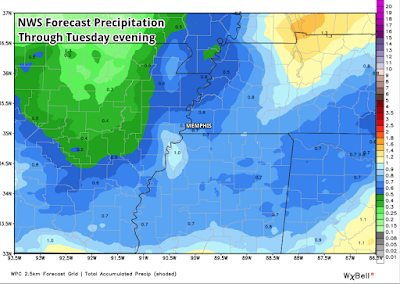 We should be dry by Tuesday night. Another "cool" day to end July with highs in the mid 80s. 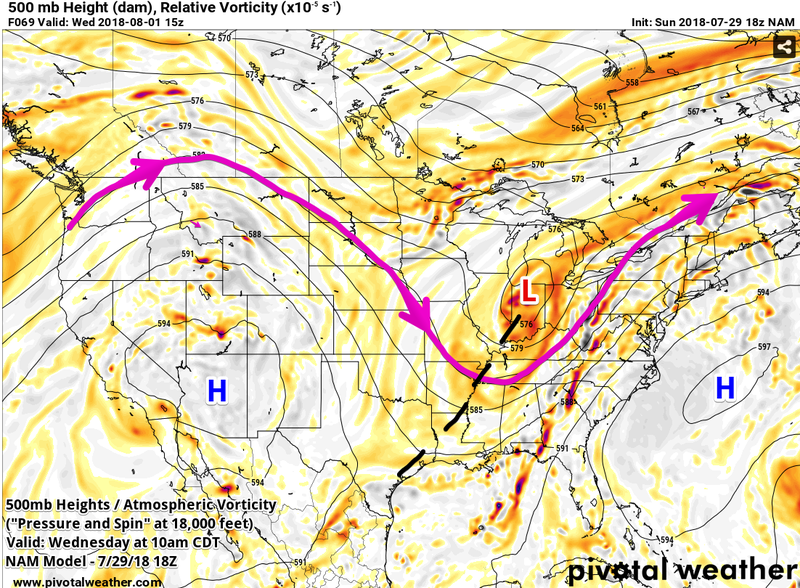 For the rest of the week, the upper level trough hangs on over the Mississippi Valley region it appears, which should keep most or all of the precipitation to our east. It also means more pleasant weather is likely, especially for mid-week as August begins. We'll certainly take that! The long-range outlooks from last week pointed to a period of below average temperatures to end July and start August and it looks like they were accurate. Look for highs in the 80s to continue! Expect dry weather to continue as well through the end of the week with temperatures moderating and humidity below summer norms with dewpoints in the 60s. Signs point to near-average conditions heading into next weekend and the first full week of August as many Mid-South kids and teachers get ready to head back to school!